The concept album was a big deal at one point. You could hold up Jeff Wayne's Musical Version Of The War Of The Worlds as a shining, if not definitive, example or how to take a story and deliver it with spoken words, music and songs, resulting in a cohesive whole, bolstered with lavish album artwork. It also translated to the stage, the touring version still filling arenas decades after the album was first released. In the 80s though, concept albums were not common and that was something Tom Galley wanted to rectify. The brother of guitarist Mel, whom he had co-written songs with during Mel's time in Trapeze, Tom came up with the idea of bringing back the concept album – but with the twist of all the songs not only working together to tell a story, but to be able to be listened to as standalone tracks. And so the first seeds of Phenomena were born. With his brother Mel on board to help with the writing and playing, Tom got busy constructing a story to base the music around. He came up with a tale about a professor who created a machine which allowed people to unlock untapped telekinetic abilities. The military show interest and the professor's adopted daughter ends up hooked up to the machine and trapped in a comatose state with her mind still feverishly active. This results in her biological father being summoned and using the machine himself to "enter into the chasms of a fantastic, multidimensional world" to save his daughter. Galley achieved his aim regarding making a concept album where the songs work as standalone cuts. The tracks here lyrically are ambiguous enough to not require the page long story and you can happily listen to 'Kiss Of Fire' or 'Still The Night' without any knowledge of the story at all. But for those who do want to indulge, the synopsis was featured in a booklet with a lavish illustration for each track by artist Iain Lowe, who painted all manner of macabre imagery under the direction of Galley. The plan was to have a full multimedia project with music videos and a feature film made to tie in, which Galley had even storyboarded, but alas the label that issued the album in 1985, Bronze Records, collapsed and things ground to a halt, leaving just the album. The record itself though, is highly impressive. Mel Galley's connections with both Whitesnake and Trapeze resulted in an all star group of musicians summoned to perform on the record. Neil Murray and Cozy Powell from Whitesnake came in to work as the thundering rhythm section, Don Airey added some keyboards alongside Richard Bailey, who helped compose much of the material with the Galley brothers. The legendary Glenn Hughes was drafted in for lead vocals, despite Hughes freely admitting he was not in great shape, having just left Hughes/Thrall, still recovering from cocaine addition and being considerably overweight. His voice however was unharmed and on the album he gives a peerless masterclass in singing. None of his overblown gymnastics or screams that he often indulged in while a member of Deep Purple, here he simply delivers a powerhouse performance befitting the nickname 'The Voice Of Rock' that would be bestowed upon him in later years. He handles the varied styles like the ethereal 'Believe', upbeat 'Who's Watching You' or catchy single 'Dance With The Devil' with absolute ease. While Galley's initial vision ended up curtailed, the first Phenomena album is nevertheless an outstanding 80s rock record with a stellar cast of performers. Despite the record label difficulties, the first album did well enough to warrant a sequel entitled Dream Runner two years later. Thomas, Hughes and Murray all returned but the project was bolstered by additional talent. In the absence of Powell, drum duties were shared between Michael Sturgis and Toshihiro Niimi, Leif Johansen was brought in for keyboard work and Kyoji Yamamoto added guitars alongside Thomas and Mel Galley. Thin Lizzy's Scott Gorham also makes a welcome appearance. The Galley brothers and Richard Bailey once again wrote the material, but due to Hughes being "a handful" to work with on the first album according to Tom Galley, additional singers were brought in. Ray Gillen, fresh from a stint where he replaced Hughes in Black Sabbath, joined the project, as did Max Bacon and John Wetton of the band Asia. Wetton features on just one track, 'Did It All For Love', but it was a hit single which gave the Phenomena project a real boost. There was a less defined story for this album, being more a collection of random ideas but that was in no way to the detriment of the album, which had a more commercial sheen than it's predecessor. The expanded collection of talent on offer was also a real plus. There are a host of standout tracks, such as the extremely catchy 'Jukebox' sung by Bacon, the excellent 'Double 6, 55, Double 4' performed by Hughes and Gillen's soaring 'Stop!' all being highlights. Personally I think the more commercial edge and the lack of a really defined story makes this a more accessible album and the material on offer is all top notch. Like anything with success, another is warranted, which brings us to the often overlooked Innervision. Work started on the album in 1988, but the landscape had changed. Instead of being driven by Galley's vision and story, now the label were driving things forward. Galley had a story but the album packaging made no reference to it in any way. His brother Mel was absent from proceedings, and so were Hughes and Murray. Galley ended up writing all the tracks with Leif Johansen, with all vocals provided by Airrace frontman Keith Murrell. Sturgis returned on drums with Scott Gorham handling the guitar work. However one truly notable guest appears in the form of Brian May, who plays on two tracks as Queen were recording 'The Miracle' in the same building at the time. Freddie Mercury was reportedly interested in singing on a track but sadly that never happened. The album wouldn't surface until 1993 due to all manner of record label politics and problems and once again the parsimonious approach meant just the album was issued, with little thought or mention of the story, let alone any proposed video or film elements. You could be forgiven for thinking the third album is the runt of the litter but that is far from the case. Murrell's performance is absolutely fantastic throughout, and the album is high quality, polished, commercial AOR. The gloriously infectious 'Into The Fire' and 'Secret Of Love' sit next to the sweeping 'Rock My Soul', heartfelt 'What About Love' and energetic 'If You Want To Rock'. It's no surprise that Gorham, Sturgis and Johansen would form 21 Guns off the back of this album as the material here is not dissimilar to their classic debut. In 2006 Escape Music issued a three disc 'Complete Works' box set, but it was done without Galley's involvement or permission due to Merv Spence, formerly of Wishbone Ash, claiming ownership to the Phenomena name as he was involved in some of the early demos. While the set served a purpose as the albums were hard to find, everything was crammed into one booklet and the discs featured some truly dreadful "bonus" tracks with Spence re-recording cuts backed by what were clearly virtual instruments. 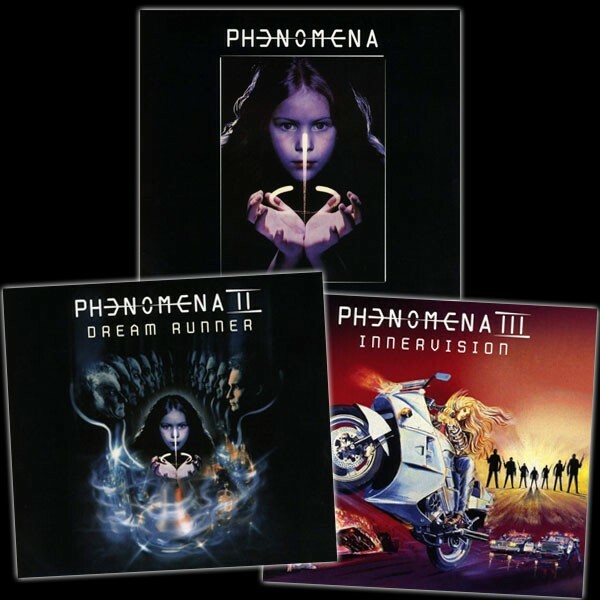 He and Galley ended up in legal battle with Galley being recognised on later albums as "The Creator Of Phenomena" and these three reissues, endorsed by Galley, are the definitive ones. With each album remastered, sonically they all sound great. The first album contains a 28 page booklet with all the original artwork included, the story synopsis, full lyrics and album credits, plus notes from Galley and Lowe. 'Dream Runner' boasts complete lyrics and rare photos and 'Innervision' contains the same, plus the newly restored original cover painting which was intended for use but never issued in any form, until now. 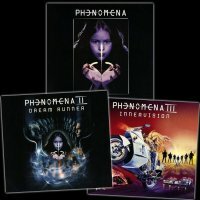 While Phenomena fell short of the initial plan to be a multimedia all-star spectacular, it still left behind these three superb records which are well worth your time and are certainly under-appreciated. If you've never sampled them, the cast alone should be enough to tempt you. If you had them on vinyl or cassette and want an upgrade, then look no further. As trilogies go, this is quite... phenomenal!